There are few dishes that are so identifiable with a place as Paella is with Spain. One could hardly think of a sunny beach on the Spanish coast without a large pan of paella bubbling away over an open fire on the sand nearby. While the modern incarnation of Paella is most associated with the region of Valencia, its roots can be traced to Arab and Roman traditions. 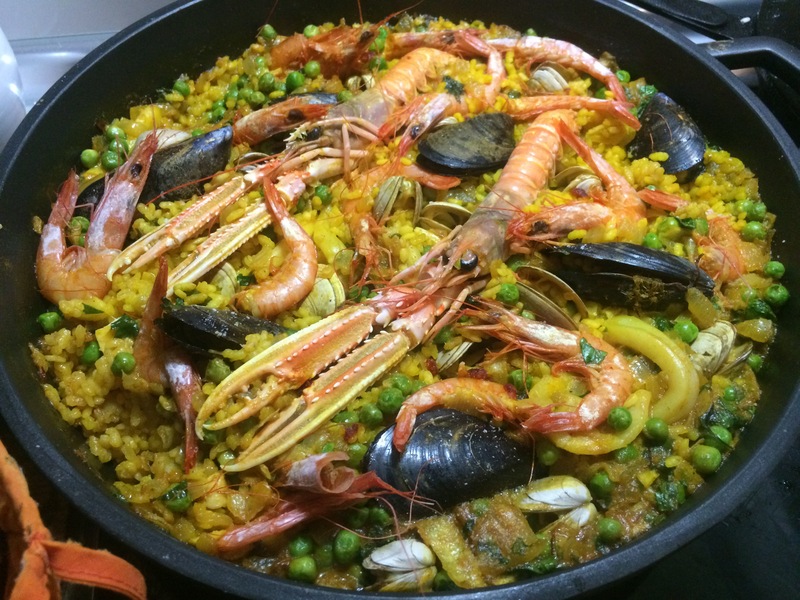 Paella can be found on countless family dinner tables across Spain for special occasions. Its most basic components are a short rounded grain rice called bomba , not unlike Arborio, and saffron for its yellow color. 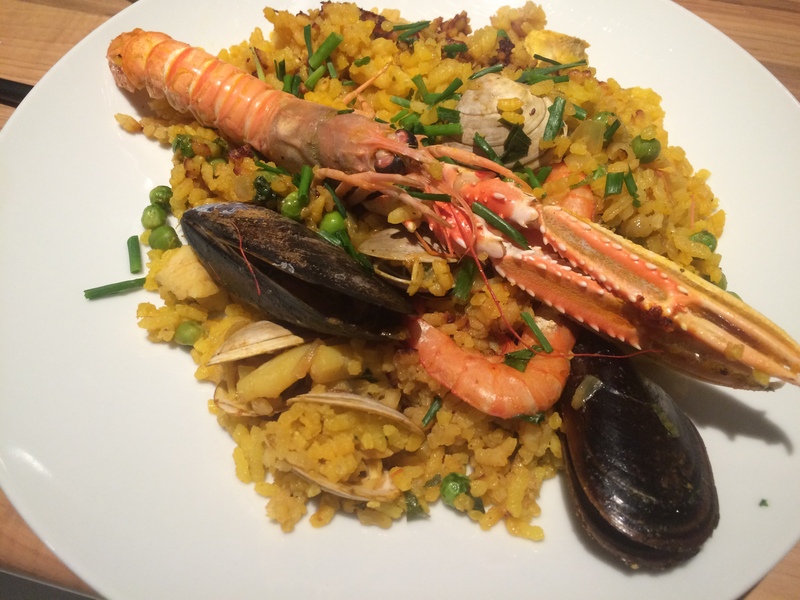 The most common version is called Paella mixta and contains both seafood and chicken or rabbit, but all seafood makes it extra festive. Cooking Paella is neither time consuming nor complicated, though it can be daunting to some. Whereas most people in America cook rice covered in a pot, Paella is made in a shallow pan (more akin to a skillet) and is covered for a few moments at most after pulling it off the heat. In fact, the name Paella refers to the pan it’s cooked in, so this process off cooking in a shallow uncovered pan is essential to the essence of the recipe. Also the liquid to-rice-ratio can vary a bit depending on the intensity of the heat source. A good rule of thumb is twice liquid to rice, but like with risotto you should have a bit more than you should expect to use and keep it on a low simmer in case you need to use it. The fumet or fish stock is the most important component to a flavorful paella. I save up shrimp shells (especially heads) and fish bones in the freezer until I have enough to make it. Just steer clear of salmon and fattier bluefish, but any whitefish bones or shellfish shells work great. Just throw them in a pot of salted water and simmer until the broth is properly infused. If you use your frozen stash of bones and shells there is no need to defrost it. Clean and steam the seafood reserving the liquid to incorporate into your stock. Chop onions, garlic, and peppers. Peel and chop tomatoes. Heat oil in the pan and brown the chicken. Add chopped squid and sauté a little. Then remove both from the pan. Add the onions, peppers, and garlic to the pan and sauté about 15 minutes. Incorporate the rice and sauté until the grains start to become translucent. Then add the spices to toast them briefly. Add tomatoes and add them and the peas to the pan. And then add in three cups of the hot fish stock. At this point most people prefer not to stir to allow the bottom to brown nicely. 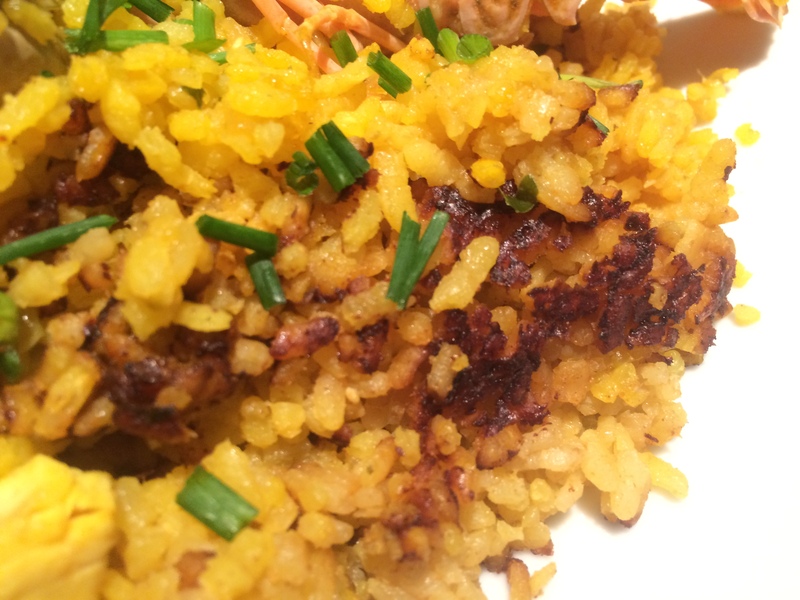 This part is called socarrado and is the most prized portion of the paella. Cook on medium high for 10 minutes. If it is looking dry you can add a bit more warm liquid. Add back in the chicken and squid. Lower to medium and cook another 7-10 minutes. At the tail end, position the cooked seafood decoratively on top of the rice. Once cooked, remove from the heat and tent with foil, or cover with lid if you have one for your paella pan. Let set for 3-4 minutes. Serve and enjoy! Paella can have any mix of ingredients you can get a hold of or have on hand; don’t get hung up on these particular meats and seafood.